A variety of imaging modalities exist for the diagnosis of stroke. Several studies have been carried out to ascertain their contribution to the management of acute stroke and to compare the benefits and limitations of each modality. Diffusion-weighted imaging (DWI) has been described as the optimal imaging technique for diagnosing acute ischemic stroke, yet limited evidence is available on the value of DWI in the management of ischemic stroke with low-field magnetic resonance (MR) systems. Although high-field MR imaging (MRI) is desirable for DWI, low-field scanners provide an acceptable clinical compromise which is of importance to developing countries posed with the challenge of limited availability of high-field units. The purpose of this paper was to systematically review the literature on the usefulness of DWI in acute stroke management with low-field MRI scanners and present the experience in Nigeria. Background: Central venous catheterization is a routine procedure in the intensive care unit (ICU) often requiring the assistance of radiological techniques. The National Institute for Health and Clinical Excellence guidelines strongly advise that the radiological marker for CVC tip be located in the superior vena cava and outside the pericardial sac, which corresponds to the level of the carina based on studies of embalmed cadavers. Objectives: The aim was to determine the justification for the post-CVC insertion chest radiograph and to determine if the chest radiograph can accurately confirm correct CVC tip placement. Materials and Methods: Fifty consecutive patients on admission in the ICU between January and December 2013, who required central venous catheterization, were studied. Catheterization was performed under strict asepsis via the right internal jugular vein by a skilled Anesthetist. Postcatheterization chest radiographs (anterior-posterior views) were performed. Results: The mean age was 36.59 ± 14.69 years, male patients constitute 30 (60%), and females were 20 (40%). CVC tips were correctly inserted in 36 patients (72%) and misplaced in 14 (28%) patients. Conclusion: The use of postinsertion chest radiograph was accurate in the determination of correct catheter tip placement. The high prevalence of misplaced catheter noted justifies the need for the chest radiograph after CVC insertion. Background: Communal/ethno-religious crises have been on the increase in many parts of the world with attendant morbidity and mortality. Assailants often target the head of their victim, intent on causing mortal harm. 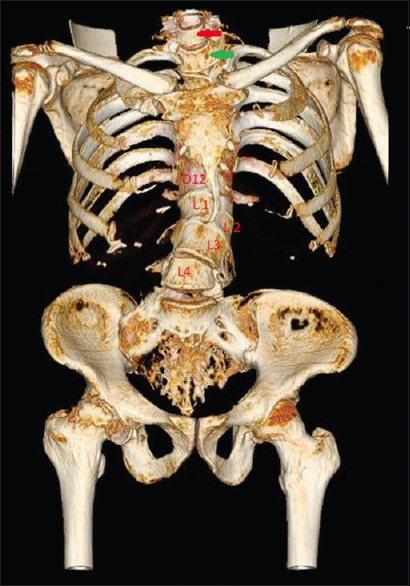 Computed Tomography is effective in demonstrating soft tissue and bony injuries. Our experience in North Central Nigeria underscores the relevance of documentation of imaging findings on patients who presented following such crises. Objective: To profile the findings on cranial Computed Tomography scan of patients with head injury during communal/ethno-religious crisis in North Central Nigeria. Materials and Methods: Retrospective and prospective evaluation of cranial Computed Tomography scans conducted on 43 victims of communal/ethno-religious crisis between January 2010 and March 2012 was carried out in the Computed Tomography suite of the Radiology Department in a tertiary hospital in North Central Nigeria. Results: Of the 43 patients, 37 were male and 6 were female (male: female ratio of 6:1). The ages of the patients ranged from <1 year to 80 years. The mean age of the patients was 36.7 years (±14.7). Abnormal findings were seen in 37 patients (86.1%) while 6 patients (13.9%) had normal scans. 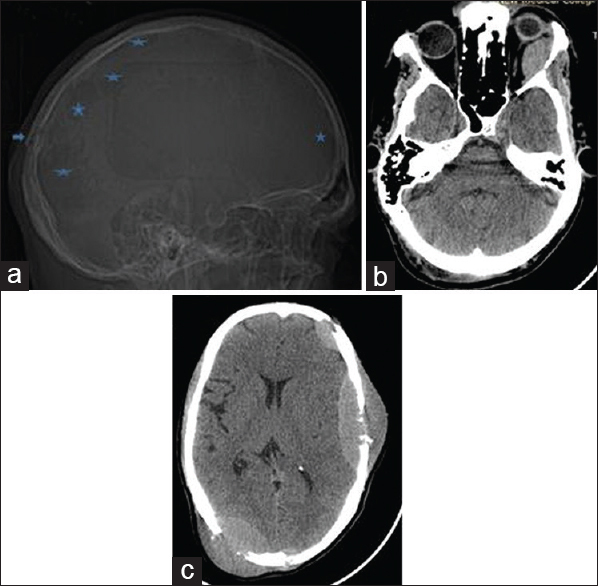 The most common Computed Tomography scan findings were intra-cerebral contusion (51.1%), skull fracture (48.8%), and subdural hematoma (23.2%). 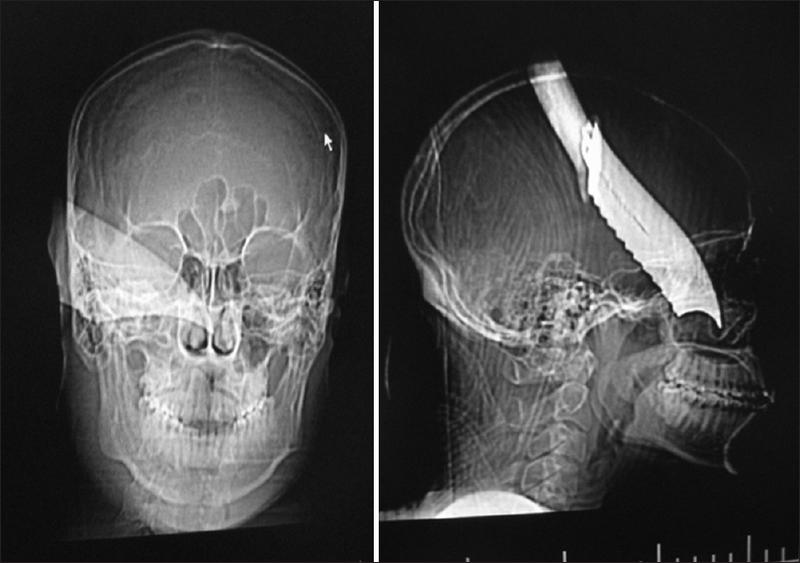 Head injury was inflicted mostly with machete cut. Conclusion: Inevitable head trauma during communal/ethno-religious crisis justifies the use of Computed Tomography scan in investigating the nature of head injury in affected victims as well as provides an invaluable guide for their prompt management. Background/Aims: The purpose of this paper is to present the various types of calcifications seen on mammograms in Nigerian women in Ibadan. 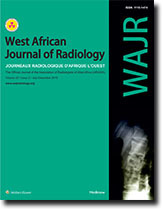 The study was to describe calcifications using the American College of Radiology Breast Imaging Reporting and Data System (ACR-BIRADS) classification, document the incidence of the various types of calcifications in a Nigerian population and also report on any association between these calcifications and the demographic variables. Materials and Methods: A prospective study of 894 mammograms done in the Radiology Department of the University College Hospital, Ibadan over a seven year period (2006–2013). The mammographic evaluation was carried out by two radiologists. 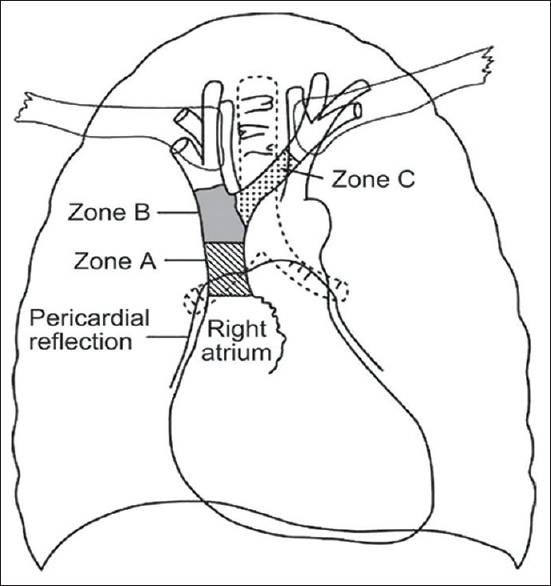 Calcifications were described and classified using the ACR-BIRADS system. Patients' demographic data were obtained using the departmental breast imaging questionnaire. Results: Of the 894 women (with an age range of 30–82 years), 213 (23.8%) had calcifications on their mammograms. Macro-calcifications (81.2%) were more common than micro-calcifications (18.8%). The most common distribution of these calcifications was the clustered type. Vascular calcifications (31.2%) were the common morphologic type of macro-calcifications while the punctate calcifications (15.5%) were the common morphologic type of micro-calcifications. About 12.3% of the women had associated masses, 3.3% had associated asymmetric density and 1.9% had associated architectural distortion. 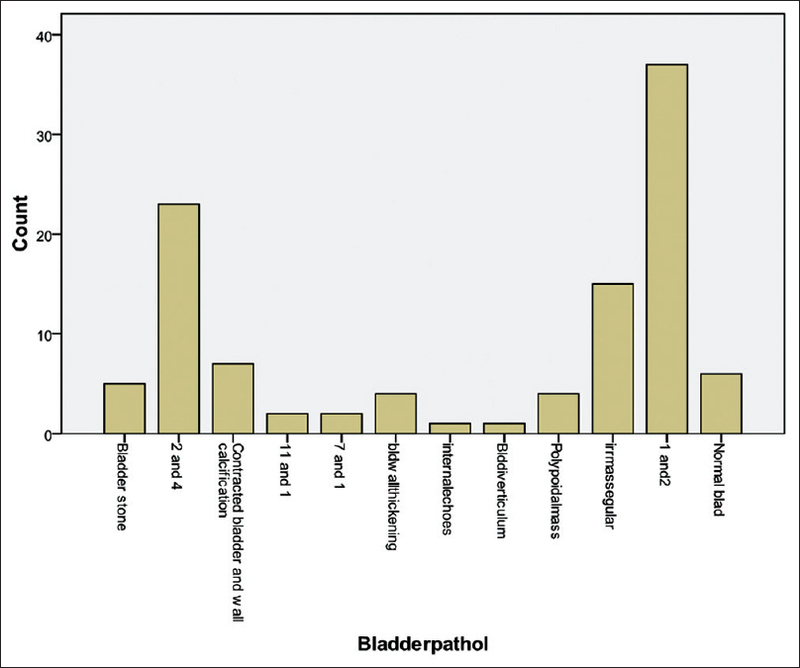 A quarter of micro-calcifications fell under 'higher probability of malignancy' (BIRADS 3) and 39% fell under 'intermediate concern of malignancy' (BIRADS 2). 18.4% of the women were asked to undergo further imaging studies. Conclusion: We have reported the various types, distributions and morphology of calcifications seen in an African population, similar to those seen in developed countries. Objective: To link the greyscale appearance of radiographic artefacts with their origin, with a view to understanding and minimizing their occurrence. Materials and Methods: A formula was used to establish a minimum sample size of 400 radiographs out of a population of 5500 radiographs produced between January 2013 and June, 2013. 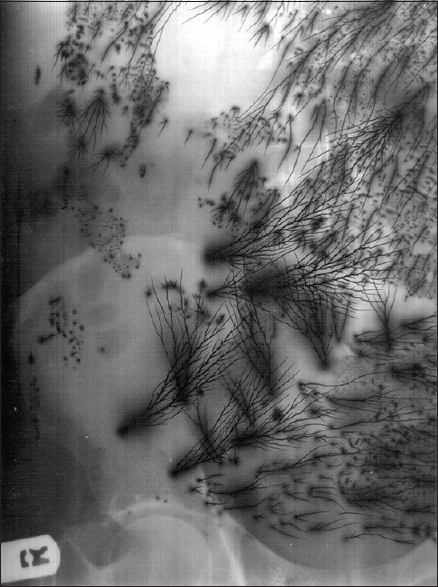 On a daily basis within the study period, all radiographs approved for reporting by the quality control radiographer with over 10 years' experience were scrutinized prospectively by the researchers with the aid of a giant 100 cm × 50 cm viewing box with brightness adjustment, until 400 artefactual radiographs were eventually isolated. The nature, greyscale appearance and origin of artefacts were arrived at by consensus and documented. Divergence in opinion and ambiguous artefacts were resolved through observation of radiographers and darkroom assistants at work, as well as darkroom simulations. The data on subdivision of artefacts was done using simple statistics. Result: 400 radiographs out of a population of 5500 were sampled for the study. Twelve specific artefacts were isolated and categorized into three distinct appearances of black, white and grey. Preprocessing, processing and postprocessing were established as a broad classification for artefacts. Dispersed dots emanating from preprocessing (grey) and occurring in cassettes had the highest frequency of 140 (35%) while grid lines, n = 3 (0.8%) was the least noted. Conclusion: All black artefacts arise during the preprocessing stage while processing and postprocessing have the middle-course greyscale appearance of artefacts. Background: The mental foramen is an important anatomical landmark and the possibility of the presence of the anterior loop mesial to the foramina is imperative to the dentist while performing various surgical procedures. Objective: To retrospectively visualize the anterior loop of the mental nerve in the panoramic radiographs. Methodology: Five hundred digital panoramic radiographs of patients who reported to Subharti Dental College, Meerut, taken between 2011 and 2013, were obtained from the Easy Dent Software. Results: At least one anterior loop was visualized in 73 (19%) radiographs out of 384 radiographs. 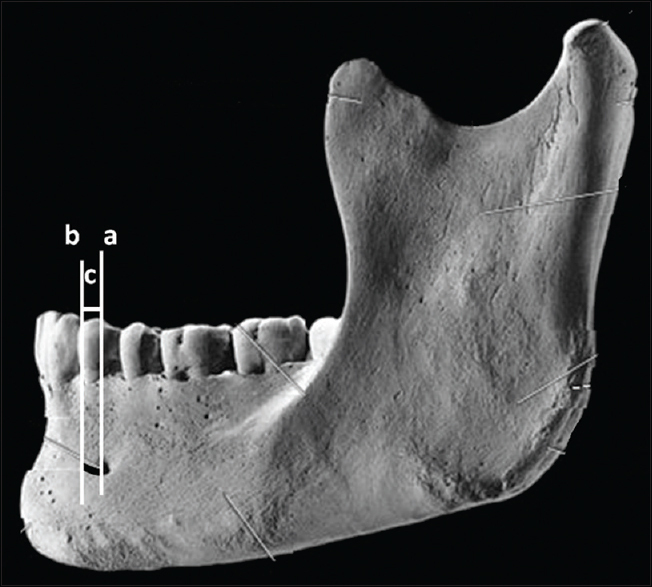 The horizontal position of the mental foramen in relation to the lower teeth was most commonly below the apex of second premolar teeth (P4) on right side in 24.73% of radiographs while on left side was present in 29.4%. 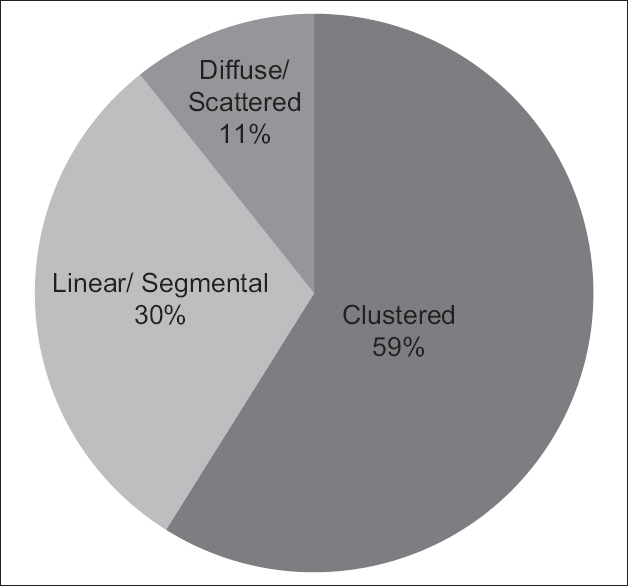 The most common radiographic appearance to be identified was the separated type (C2) which was found to be 14.06% and 17.70% on right and left side respectively. Conclusion: The anatomical landmark of the mental foramen is of paramount importance. The clinicians need to pin-point its location before the placement of implants in the foraminal region. Panoramic radiographs can be resourceful with its explicit depiction and confirmation of the presence of the anterior loop of the mental nerve. Injury to the mental nerve during implant placement can be avoided by identifying this anatomical landmark using advanced imaging modality and the surgical verification. Myoepithelioma is a very rare benign neoplasm, which is composed entirely of myoepithelial cells and accounts for <1% of all salivary gland tumors. 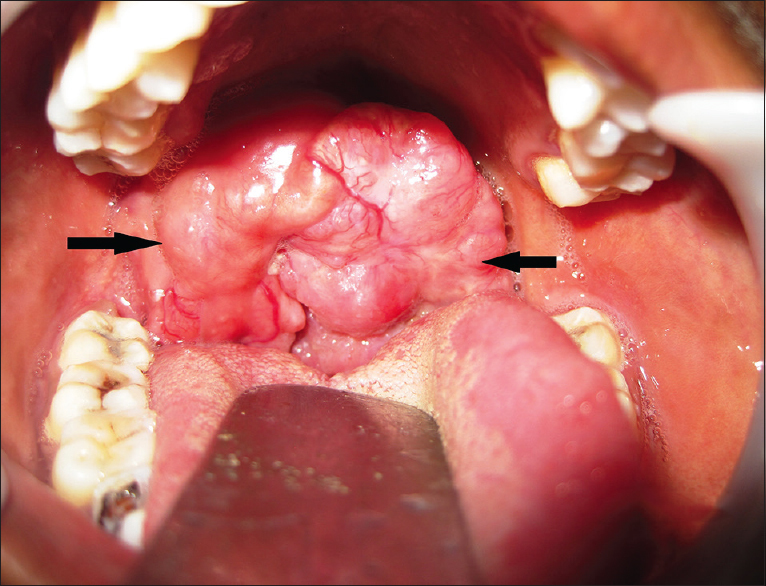 Of all the myoepitheliomas arising from salivary glands, 26% involve the minor salivary glands of the oral cavity, where the palate is the most common origin of intraoral myoepithelioma. 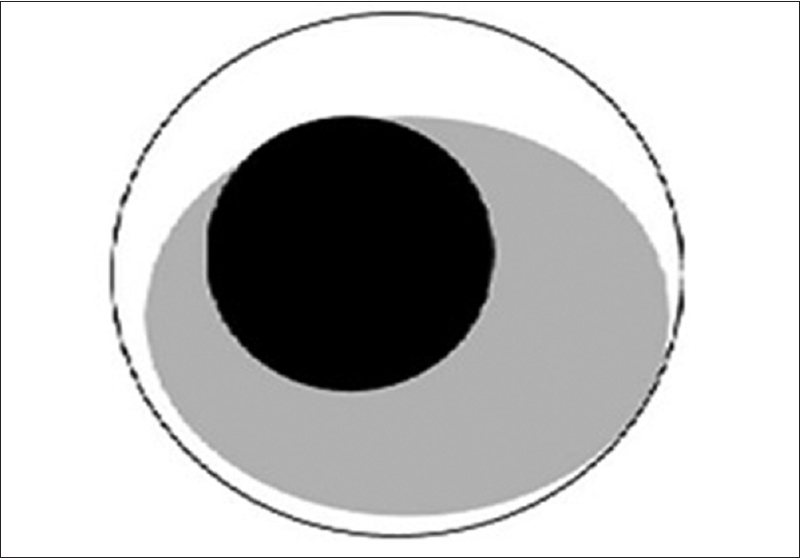 Final diagnosis of myoepithelioma can only be done by histopathological examination and cannot be predicted preoperatively solely on clinical or radiographic grounds. We are presenting a case of myoepithelioma of soft palate in a 35-year-old female patient with emphasis on its radiological and histopathological appearances. Hydrocele of the canal of Nuck is a rare cause of inguinal swelling in females. It is usually seen in the newborn and in children and rarely seen in adult females. We report a case of hydrocele of the canal of Nuck in an 18-month-old female who presented with a swelling in the left inguinal region, extending into the labia majora. Abdomino-pelvic ultrasonography revealed a tortuous heterogeneously hyperechoic structure inside an anechoc sac. 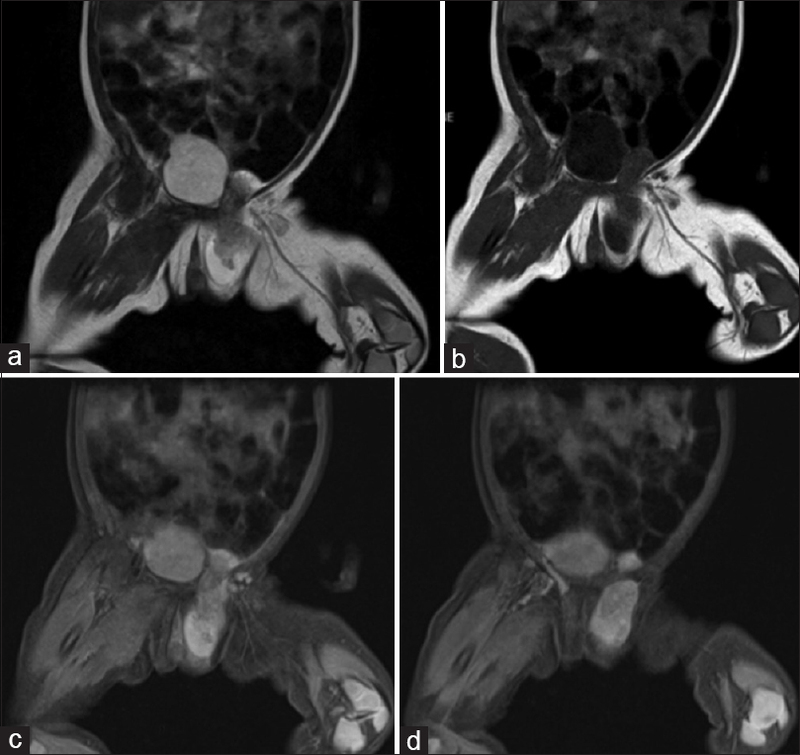 Magnetic resonance imaging was done for further evaluation, which showed an elongated cystic lesion in the left inguinal region extending into the left labia majora. There was a heterogeneous tubular structure seen inside the sac, which appearance resembled the round ligament and ovary. These findings were suggestive of hydrocele of the canal of nuck with herniation. Surgery was done which confirmed a hydrocele of the canal of Nuck with herniation of the round ligament, left ovary and part of the uterus in the sac. Primary skull vault non-Hodgkin's lymphoma with extra- and intra-cranial soft tissue components in an immunocompromised patient is extremely rare. There are only four cases reported in literature till date and in none were the lesions multifocal or had a discrete intraorbital component. We report such a case of multifocal primary skull vault lymphoma successfully managed in an acquired immunodeficiency syndrome patient. Distinguishing primary bone lymphoma from other skull vault lesions is important because of different management protocols. The characteristic appearance of Candida esophagitis on barium studies is that of diffuse discrete mucosal plaques, which may become confluent to form 'cobblestone or shaggy' esophagus. Many authors have also reported different radiographic findings such as a foamy appearance in florid esophageal candidiasis in immunocompromised patients. 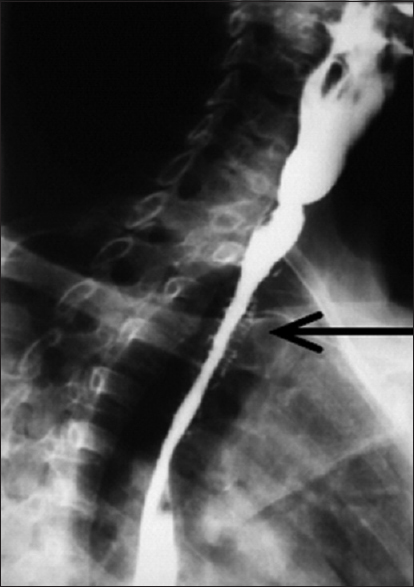 This report discusses a “feathery” appearance seen in barium esophagography of a 74-year-old woman who presented with dysphagia. The barium swallow showed fine out- pouching giving a “feathery” appearance, which is similar to what is described as pseudo-diverticulosis in patients with esophagitis complicating gastro-esophageal reflux disease. A diagnosis of esophagitis presumably due to candidiasis was made. This was confirmed by fungal studies on biopsy specimen following flexible esophagoscopy. Radiologists should be aware of this rare manifestation as a new sign of Candida esophagitis in order to avoid unnecessary delay in diagnosis and treatment. A 38-year-old woman was admitted to this hospital because of intermittent claudication in the lower limbs for 2 years. Lower limb pulsations were absent bilaterally. She was evaluated and diagnosed to have Takayasu arteritis (TA). 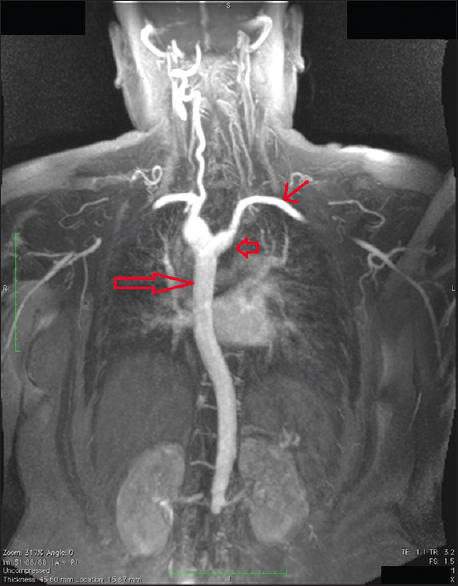 The magnetic resonance angiogram revealed a right arch of aorta with aberrant left subclavian artery (LSA). An association of TA with right aortic arch and aberrant LSA has not been reported so far.